A few thoughts on accepting the authority of the Church, regardless of its sinful members, as a means of coming to terms with the right place of Holy Scripture and Marian doctrine. Whether this is the issue for the reader or not, the question of Church authority played a big part in my dealing with Catholic teaching about Mary, and whether I would accept that teaching or not. So this is more of a personal response. Having been in Protestantland for a few decades, and only just recently come into the Church, I can say I feel the reader’s pain. And the “show me where in the Bible” response just makes so much sense. But then I wrestled with the issue of authority and the Church won (I’m deeply happy to say). However, the Church “winning” is not to set the Church against the scriptures, rather it is to finally place the scriptures in their proper place, neither above nor below, but as part of the Church. And, though it is my responsibility to use the rationality God gave me as I seek the Truth, it is not my place to decide doctrine apart from the Church established by Christ and animated by the Spirit. I’ve come to the conclusion that the best approach is to have an “I trust the Church, where else am I to go” attitude. This is not a blind, turn-off-my-brain approach, for it is also scriptural. Rather, it is about following Christ; it is about avoiding the “I refuse to believe unless I see it with my own eyes” attitude and, instead, to carefully and prayerfully trust. But that’s the issue isn’t it? The Church is full of sinners, has many troubling parts of its history (past and present), that to trust the Church seems like something only a fool would do – at least to someone on the outside looking in. I’ve been there. Mistrusting the Church often arises from a “you shall know them by their fruits” perspective, and to some this clearly damns the Church. It takes a lot for a Protestant to accept the authority of Christ propagated through His Church, through the bishops and popes, and through all that sinful detritus that seems to clog the works. I find myself clinging to the words of Chesterton: “The Church is justified, not because her children do not sin, but because they do.” If we cannot accept that, then we will not accept the Church as the authority, binding and loosing, preserving and carrying forward the gospel as handed down and developed from the beginning. But the authority of the Church is one of the great gifts of salvation history given to us. It is, in fact, a great relief. 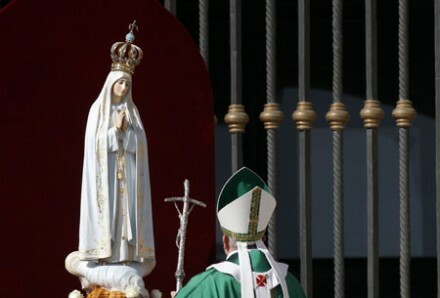 And if the Church has such authority then one should bow the knee to Christ by accepting what the Church declares as true in morals and doctrine – including its teaching on the Blessed Mother. Call me a fool, but I praise God for the Magisterium. “When we set up a house, darling (honeysuckle porch, yew clips hedge, bees, poetry and eight shillings a week), I think you will have to do the shopping. Particularly at Felixstowe. There was a great and glorious man who said, ‘Give us the luxuries of life and we will dispense with the necessities.’ That I think would be a splendid motto to write (in letters of brown gold) over the porch of our hypothetical home. There will be a sofa for you, for example, but no chairs, for I prefer the floor. There will be a select store of chocolate-creams (to make you do the Carp with) and the rest will be bread and water. We will each retain a suit of evening dress for great occasions, and at other times clothe ourselves in the skins of wild beasts (how pretty you would look) which would fit your taste in furs and be economical. “… By all means let us have bad things in our dwelling and make them good things. I shall offer no objection to your having an occasional dragon to dinner, or a penitent Griffin to sleep in the spare bed. The image of you taking a sunday school of little Devils is pleasing. They will look up, first in savage wonder, then in vague respect; they will see the most glorious and noble lady that ever lived since their prince tempted Eve, with a halo of hair and great heavenly eyes that seem to make the good at the heart of things almost too terribly simple and naked for the sons of flesh: and as they gaze, their tails will drop off, and their wings will sprout: and they will become Angels in six lessons…. “I cannot profess to offer any elaborate explanation of your mother’s disquiet but I admit it does not wholly surprise me. You see I happen to know one factor in the case, and one only, of which you are wholly ignorant. I know you … I know one thing which has made me feel strange before your mother – I know the value of what I take away. I feel (in a weird moment) like the Angel of Death. 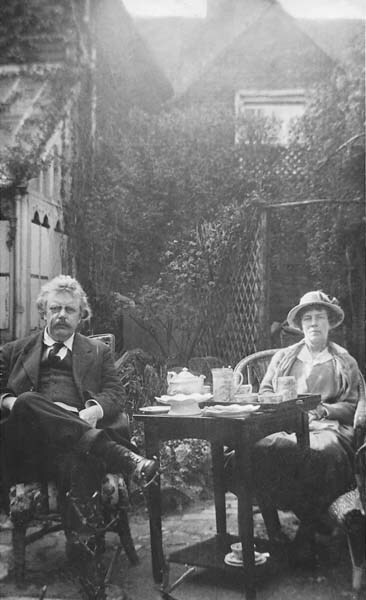 “… Gilbert Keith Chesterton was born of comfortable but honest parents on the top of Campden Hill, Kensington. He was christened at St. George’s Church which stands just under that more imposing building, the Waterworks Tower. This place was chosen, apparently, in order that the whole available water supply might be used in the intrepid attempt to make him a member of Christ, a child of God and an inheritor of the Kingdom of Heaven. “Of the early years of this remarkable man few traces remain. One of his earliest recorded observations was the simple exclamation, full of heart-felt delight, ‘Look at Baby. Funny Baby.’ Here we see the first hint of that ineffable conversational modesty, that shy social self-effacement, which has ever hidden his light under a bushel. His mother also recounts with apparent amusement an incident connected with his imperious demand for his father’s top-hat. ‘Give me that hat, please.’ ‘No, dear, you mustn’t have that.’ ‘Give me that hat.’ ‘No, dear – ‘ ‘If you don’t give it me, I’ll say ‘At.’ An exquisite selection in the matter of hats has indeed always been one of the great man’s hobbies. “When he had drawn pictures on all the blinds and tablecloths and towels and walls and windowpanes it was felt that he required a larger sphere. Consequently he was sent to Mr. Bewsher who gave him desks and copy-books and Latin grammars and atlases to draw pictures on. He was far too innately conscientious not to use these materials to draw on. To other uses, asserted by some to belong to these objects, he paid little heed. The only really curious thing about his school life was that he had a weird and quite involuntary habit of getting French prizes. They were the only ones he ever got and he never tried to get them. But though the thing was quite mysterious to him, and though he made every effort to avoid it, it went on, being evidently a part of some occult natural law. “He went for a time to an Art School. There he met a great many curious people. Many of the men were horrible blackguards: he was not exactly that: so they naturally found each other interesting. He went through some rather appalling discoveries about human life and the final discovery was that there is no Devil – no, not even such a thing as a bad man. “One pleasant Saturday afternoon [his friend]Lucian said to him, ‘I am going to take you to see the Bloggs.’ ‘The what?’ said the unhappy man. ‘The Bloggs,’ said the other, darkly. Naturally assuming that it was the name of a public-house he reluctantly followed his friend. He came to a small front-garden; if it was a public-house it was not a businesslike one. They raised the latch – they rang the bell (if the bell was not in the close time just then). No flower in the pots winked. No brick grinned. No sign in Heaven or earth warned him. The birds sang on in the trees. He went in. “The first time he spent an evening at the Bloggs there was no one there. That is to say there was a worn but fiery little lady in a grey dress who didn’t approve of ‘catastrophic solutions of social problems.’ That, he understood, was Mrs. Blogg. There was a long, blonde, smiling young person who seemed to think him quite off his head and who was addressed as Ethel. There were two people whose meaning and status he couldn’t imagine, one of whom had a big nose and the other hadn’t…. Lastly, there was a Juno-like creature in a tremendous hat who eyed him all the time half wildly, like a shying horse, because he said he was quite happy…. “But the second time he went there he was plumped down on a sofa beside a being of whom he had a vague impression that brown hair grew at intervals all down her like a caterpillar. Once in the course of conversation she looked straight at him and he said to himself as plainly as if he had read it in a book: ‘If I had anything to do with this girl I should go on my knees to her: if I spoke with her she would never deceive me: if I depended on her she would never deny me: if I loved her she would never play with me: if I trusted her she would never go back on me: if I remembered her she would never forget me. I may never see her again. Goodbye.’ It was all said in a flash: but it was all said…. “Two years, as they say in the playbills, is supposed to elapse. And here is the subject of this memoir sitting on a balcony above the sea. The time, evening. He is thinking of the whole bewildering record of which the foregoing is a brief outline: he sees how far he has gone wrong and how idle and wasteful and wicked he has often been: how miserably unfitted he is for what he is called upon to be. Let him now declare it and hereafter for ever hold his peace. Found here. From a letter Chesterton wrote to his fiance, Frances Blogg, which is reprinted in Maisie Ward’s 1942 biography, Gilbert Keith Chesterton. There is then the Recessional, and there may be a closing hymn, but that is the end of the Mass. However it is said, we are told to go in peace – that peace being the peace of Christ. What does this mean, to go in peace? We leave the Mass, having been fed at the table by the body and blood of Christ, and enter back into the world. One thing is clear, this world is not at peace. But we, followers of Christ, must go in that peace which is the peace of Christ. We go into this un-peaceful world with and in the peace of Christ. We live in a time and place where individualism reigns, and much of modern Christianity follows suit. Salvation becomes a purely existential affair, with great emphasis placed on one’s psychological and emotional state of being. Thus this peace of Christ can easily be understood as a feeling of peace one has, however briefly, at the end of Mass; a good, warm, fuzzy feeling of goodness and, perhaps, fellowship. Emotions are important, and the warm fuzzies are not nothing, but the peace of Christ is not (or not only) about how we feel. Nor is it merely that we enjoy some light and friendly banter with our fellow parishioners until we head for the car. This is obvious, and I don’t want to present a straw man in order to make an equally limp point. We know that the peace of Christ is the only solution to the horrors of this world, the enmity between man and man, and between man and God. We know it is only the peace of Christ that can overcome the death that sits at each of our doors, and ravages the world. And so we know there is something far more substantial to this peace than peaceful vibes. And at this point we turn to those around us, usually shake their hand and say something like, “Peace be with you.” Some might think this small exchange (of what might be derided as mere niceties) between the people of the Church is rather innocuous. But it is, in fact, a small moment of acknowledgement of our shared community of faith, and a little bit of “practice” for what we will be called to do at the end of Mass. We celebrate the peace between us and God, won for us by the sacrifice of Christ, and we begin to show how we are bearers of Christ’s image to the world by first reaching out the hand to those nearest to us and offering warm greetings. As a final note, perhaps an indication of our trouble with peace is how quickly our minds shut down when we hear the word pacifism. We tend to think pacifism as being fundamentally untenable. In a way it is. According to the rules of this world pacifism will not help one get ahead. Put another way, if one puts on the mind of Christ, then one will suffer. Christ suffered. The Apostles suffered. 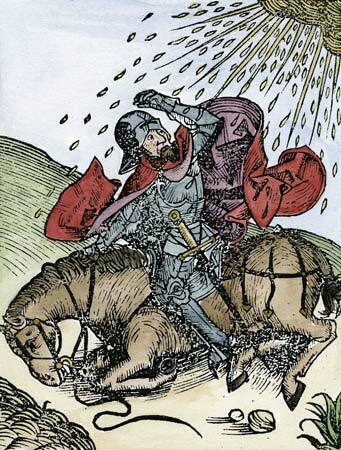 The early Christians suffered. Many Christians today suffer. But remember, it is God who fights our battles for us. We are called to love, and to be willing to suffer, for our sufferings in this life do not compare to the glory yet to come. If God is for us who can stand against us? Do not fear those who can merely kill you. I write these words mostly for myself, for I am weak. We get the word pacifism from the French pacifisme, which is derived from pacifique, but its roots go back Latin pācificus which comes from pāx (“peace”) + faciō (“I do, make”). In other words, pacifism means “peace making.” Note: Do not confuse pacifism with being passive. The word “passive” comes from different roots and is related to the idea of suffering, not making peace. We are called to suffer, true, but we are also called to be peace makers. They go together. Take up your cross and follow the merciful God. Love your neighbor as yourself. Love your enemy. Without Christ pacifism makes no sense. With Christ, pacifism is the only choice. Go in the peace of Christ. First: Here’s the idea that’s been in my mind lately – Saying Protestant churches do not represent the Church established by Christ is not to say that individual Protestants are not Christians (or, for that matter, saying individual Catholics are), or that the gospel is not preached from their pulpits, or that the Holy Spirit is not active in their lives, but it is meant to point us to that critical scene when Jesus met Saul of Tarsus on the road to Damascus and accused him of persecuting Him because Saul was persecuting the Church, that we should then ask if that Church is still visibly with us today. I say yes it is visible, but that visible Church is not the Protestant churches accepting (or embracing) the spirit of division and denying apostolic succession. 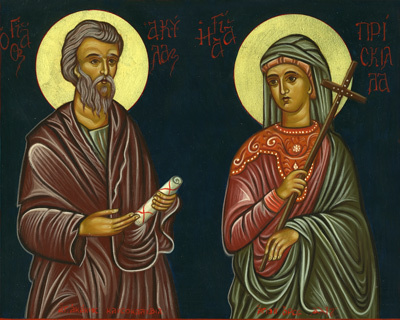 We might think as an analogy of the story in Acts when Priscilla and Aquila met Apollos, who only knew the baptism of John, and they taught him the whole gospel. If Apollos had rejected the whole gospel and stuck only with the baptism of John, he would be lost even though he still had some crucial piece of the truth – though God, of course, could choose to save him. In a similar way, Protestants who claim to know only Christ crucified, and then reject Christ’s visible Church, put themselves on thin ice. Further, Protestantism is as fragmented and dis-unified a group as could be. Remember, when Paul writes to the Corinthians that he knew “nothing among you except Jesus Christ, and him crucified”, that he was arguing their disunity demonstrated they didn’t really know “Jesus Christ, and him crucified.” Paul was both pointing to Christ and defending the unity of the visible Church. They go together. Why not obey Christ fully within the Church? The question one could pose is, what are you really protesting? What are you clinging to that is more important than following Christ and His apostles in their prayers and pleading for unity? Parsing theological nuances is interesting, wrangling over theories of atonement is somewhat important, but we must make sure we don’t fall into the trap that says: “So now faith, hope, and love abide, these three; but the greatest of these is faith.” Faith alone leads inevitably to division. Love leads to unity. Faith is important, critical, required, but love trumps faith. Faith is not the greatest, love is the greatest. Unity is the result of love. So back to the cartoon – and this is my real reason for writing this post – The Catholic Church views both Orthodox and Catholic together being the true, apostolic Church, though in schism and thus not without insignificant theological and practical differences that must be resolved. I may be selfish in this idea because I have friends who are Eastern Orthodox, and I was once at that doorstep contemplating giving my life to that confession, thus I want to see unity there. I know there is not unity as there should be, but perhaps hope, the other theological virtue, along with love, will have its day. But it naturally follows then that the Protestant churches, being non-apostolic, yea even apostate, churches are in grave rebellion to the true Church established by Christ and maintained by the Holy Spirit. As implied above, this is not to say that individual Protestant Christians are not destined for the Kingdom of God, nor is it to say that all Orthodox and Catholic Christians are destined for the Kingdom of God. That is up to God alone. But if my intuition is right, why would one want to remain in an apostate Protestant church in outright rebellion against the historical, apostolic Church? Especially if one’s rebellion was really just handed down for generations and has lost much (or all) of its meaning? (Like either fervently or lazily maintaining a family feud for no reason other than that’s just what one is supposed to do.) Or especially if one is a non-denominational evangelical merely because in college one had a crisis of faith and found that the good vibes, warm handshakes, and upbeat music at a roommate’s church made one feel like something real was happening there (and there probably was). I know many will answer with the predicted Protestant laundry list of arguments, but really, there are excellent, biblically grounded, Catholic answers to all of them – and if there are, even if the arguments end in a kind of tie, stop arguing and just join up. Bow the knee to Christ, who gave you the Church. One enters the Church not because of an argument, but because of Christ. Therefore one should not stay outside the church because of an argument. Come be with Christ, fellowship in His Church, partake of His body and blood in the Eucharist (Jesus Christ, and him crucified), embrace the communion of saints, do not harden your hearts. When Christ first came to Saul of Tarsus He did not say, “Why are you persecuting My Church.” Rather, He said, “Why are you persecuting Me?” And yet, was not Saul persecuting Christians, was he not persecuting the Church? Had not Christ left the world? Paul was looking for real people, real Christians, looking for the places they worshiped, looking for the visible Church. He was not looking for Jesus. There is a direct connection between the visible, apostolic Church and Christ Himself. Therefore, if one rejects (not the same as criticizing or judging) the visible, apostolic Church one is rejecting Christ. Perhaps many who call themselves Christians are in greater jeopardy than they realize, like all those who say they love Jesus and hate religion. It may well be that those who make such declarations have unknowingly declared their love of an imaginary Jesus and have rejected the real Jesus. Of course I can’t know anyone’s heart or what God will ultimately will for anyone, but I figure it’s at least worth examining oneself and the reasons for one’s choices in this regard. In summary, I say do not remain outside the Church Christ Himself established because of weak arguments, tradition, laziness, what someone else told you, mere prejudice, what others might think of you, fear of the unknown, fear of being uncomfortable, or worst of all, pride. Perhaps pride and ignorance are the two main reasons why many Protestants remain Protestants. That’s the way it was for me. As I see it, Orthodox Christians and Catholic Christians need to make a strenuous effort toward reconciliation, which I believe is already happening. And that Protestants need to repent of their rebellion and bow their knees to Christ’s authority (as do we all) which was and is promulgated through His apostles and their successors. I say this not to point fingers at individuals, but to speak in broad terms. We all need to bow the knee, but Protestantism, as an historical phenomenon, is a “tradition of men,” and is based on rejecting the Church established by Christ himself and maintained by the Holy Spirit, all in the name of self-determined Biblical interpretation. In other words, Protestantism arose not as a reformation, but as a rebellion; as a wrong response to very real problems. Protestants would have you believe the issues are theological, I know because I was one for more than 40 years, but in fact the issues are spiritual and of the heart. I would guess that most Protestants don’t know this, not consciously at least, and that there is something to “ignorance is bliss.” In fact, and this is the way I thought for most of my life, most Protestants couldn’t care less if a church is “apostolic”, not because they really don’t care, but because they don’t know they should care. I have to come clean: I came into the Catholic Church in September of 2013. I’m a newbie Catholic, and naturally I have a tendency toward “Catholic good, Protestant bad” ways of thinking. I don’t want to be that way, but I did make a decision for Catholicism after years of careful study, prayer, and seeking the wisdom of others. Mostly, though, I made my decision in response to a call from the Holy Spirit. The thing is, having been a Protestant for more than 40 years, and having wrestled with Protestant theology versus Catholic & Orthodox theology, I know the Protestant arguments rather well. I know the “laundry list” of Protestant reasons why they can’t be Catholic, and frankly, I know they don’t hold up. This is not to say I am much of a theologian, or Church historian, or even a good Christian, but I can say that the two biggest reasons Protestants remain Protestants are pride and ignorance. Ignorance of what Catholics really teach and, ironically, ignorance of what Scripture really says. Pride is that refusal to bow the knee to the authority of the apostles by insisting that oneself (or one’s pastor) be the final authority of truth. Sola Scriptura fails right at the point it is supposed to succeed because it finally comes down to interpretation – who is right, who wins, who has the authority to guard doctrine? Every man a pope as the saying goes. One of the fruits of Protestantism is rampant disunity, including a spirit of disunity that is worn as a badge of authentic faith. The disunity between Orthodox and Catholic Christians is deeply troubling, and probably not unlike the grave disunity in the newly formed churches St. Paul addresses in his letters (I am of Paul, I am of Apollos, I am of Christ). And one could argue it’s due to ignorance and pride as well. What I see is that Catholics and Orthodox tend to be troubled by their disunity, though many may not yet see a solution. But the outright explosion of massive and inherent disunity among Protestants is deeply frightening. More than that, it speaks to something gravely wrong-headed and wrong-hearted at the center of Protestantism – a spirit of division based on personal interpretation of Holy Scripture (not unlike a consumerist “market economy” version of Christianity). In other words, the disunity between Orthodox and Catholic is a rending of a garment, a tear that is unnatural and needs to be repaired. The disunity at the heart of Protestantism is its reason for existence, not a result so much as the starting point, and that calls for repentance. Commit oneself to unity, the kind of unity for which both Christ and the Apostles prayed. Repent each day. Remember that love is greater than faith. Pray continually. Embrace the Sacraments. Work out your salvation with fear and trembling. Commit to holiness. Be a saint.